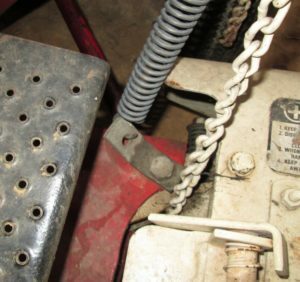 Someone contacted me about pictures for the chain routing on a Haban Sickle bar mower. Since I took the pictures, I thought I might as well add them here. 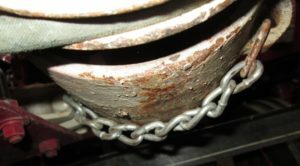 The chain connects to the bottom of the main gear box and wraps around under the gearbox when the sickle bar is in the raised position. It’s hard to get a good picture of it, but here’s the best I can do. The chain wraps around under the gear box, goes up and over the pulley that’s on the extended arm and down to connect to the spring. 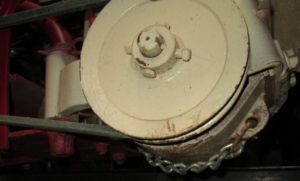 Since the chain is wrapped around the gear box, it unwraps as the cutter bar is lowered loosening tension on the spring and letting the cutter bar lower and and lay flat on the ground. It’s not that elaborate and eliminates the need for any sort of additional lifting mechanism. 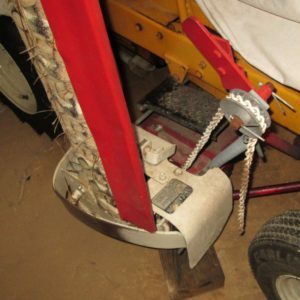 The other end of the spring connects to a bracket mounted on the main frame of the mower. And that’s it. As always if you have additional questions or comments, you can contact me through this website.